I already have the interface set up and enabled and there is no IPv6 on it, just IPv4. Not sure why I am getting this error - my SITE1 pfsense box didn't do it for me. Tried completely removing all of the config and rebooting and then re-creating the GRE tunnel/interface and it still throws me the error. 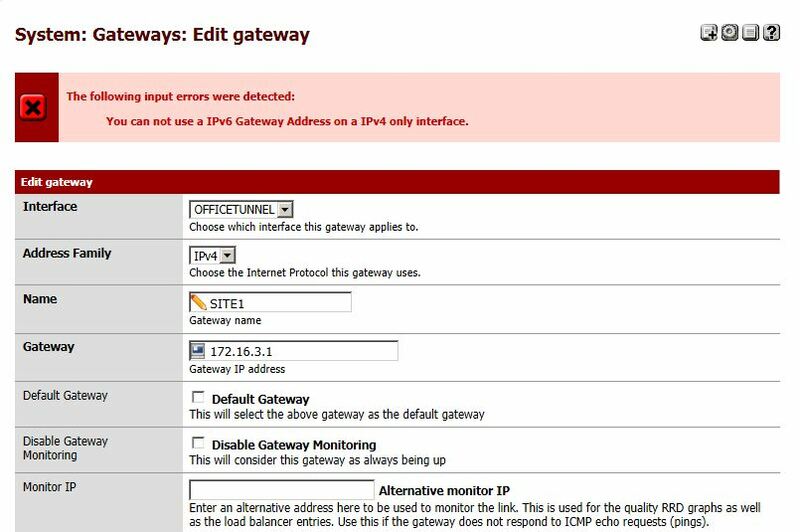 I can remove the gateway IP address and get it to save - but then it just shows up as "dynamic." Any ideas? i'm running a build from nov 14th. i just setup a bogus gre tunnel, assigned it an interface,enabled it ipv4 only and added a ipv4 gateway to it. That was the ticket man thanks. I was a little leery about the update since I did some beta updates before and they broke things but this seems to have solved it. I appreciate the reply.